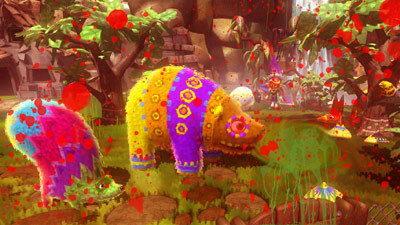 Last year, there were two games that really made an impression on me, Left 4 Dead and Viva Piñata: Trouble in Paradise. While Viva Piñata was cute enough to make Hello Kitty jealous, Left 4 Dead just wasn't cute enough. Fortunately, the folks at Valve as well as Rare and Microsoft Game Studios have combined forces to create the most intriguing cross-over ever: Left 4 Piñatas: Sour Infestation. The premise here is simple. Remember those pesky sour piñatas from previous Piñata games? Well, while you were busy gardening, they were busy eating brains! The sour piñata problem started getting out of control and soon they started overtaking the Piñata Planet. Now there are only four piñatas left: the svelte Syrupent, the nonchalant Bonboon, the experienced Squazzil, and the possibly formerly incarcerated Mousemellow. Although these piñatas come from all walks (or crawls) of life, they all join together in the Garden of Death in order to make the piñatas last stand. Together, these piñatas must fight against the evolved forms of sour piñatas, which include the tongue lashing Mallowolf, the morbidly obese Chippopotamus (who tends to puke a lot), and the sneaky Whirlm. These sour piñatas' only weakness seems to be specially outfitted candy shotguns, which spew sweet treats at such a high velocity that it can take a sour's head off. Of course, decapitation is the only way to keep a bad piñata down, so you'll have to really perfect that headshot. While Left 4 Piñatas' story mode is plenty of fun to play through online, the three extra modes, Bloodbath, Slaughter, and Dismemberment are what really make this game worth the purchase. Bloodbath is the most straightforward mode, as it sends hordes of sours towards your team of four, and it will be your job to kill as many piñatas as possible before succumbing to the dark piñata abyss yourself. Slaughter mode flips this idea and allows you to take the role of a sour piñata and kill all the regular piñatas as fast as possible. The final mode, Dismemberment, lets you play through selected modes with genetically mutated piñatas who can only be killed by brutally pulling off their extremities with a specially made weapon: the taffy maker buzzsaw. In addition to these gameplay modes, there is also a sour breeding mode, similar to those found in other Viva Piñata games. However, instead of putting two loving piñatas together in a home and playing a mini-game, you must put two bloodthirsty piñatas together in a cage and assemble a new, hybrid piñata out of the pieces that are left once the carnage is done. The new, hybrid piñata will then be stored in the Necro-Piñata-Nomicon and can be summoned by the living piñatas. Overall, Left 4 Piñatas is the best game I have played so far this year. The gory visuals are amazing to behold, and all the different modes ensure you will be chopping up piñatas for quite some time. Well, at least until the handheld follow-up, Vicious Pinata: The Last Stand arrives on the new Xbox LIGHT! The piñatas, both living and sour, are animated with stunning detail. The blood and candy effects are especially impressive, and dismemberments are horrifyingly beautiful. Although hacking and slashing is easy enough, performing long, chained Piñata Peril attacks, which use specialty weapons like peppermint-crafted hacksaws (Pep-o-saws) and Chocolate-covered revolvers (Chocolers) can be a little bit cumbersome. The yelps and screams of sour piñatas who fall victim to your candy shotgun is enough to chill your blood for weeks to come. Minimalist music recalls the sounds of a carnival ride. With an utterly horrifying story mode, plus the brutal Bloodbath, Slaughter, and Dismemberment multiplayer modes, you'll be destroying sour piñatas until your own zombie apocalypse - I mean, bedtime.